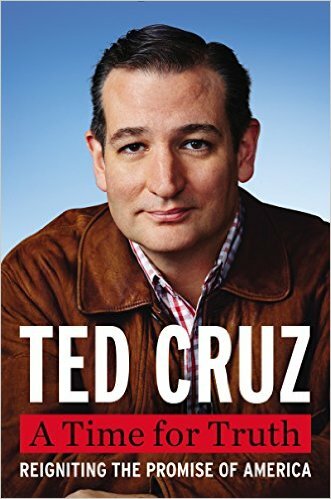 Senator Ted Cruz's recently-released biography will be landing on The New York Times' best-seller list this week, after its initial omission saw a week of accusations, recriminations, disputations, and refutations. The list is not due out until tomorrow, but The Hill reports that A Time for Truth will debut at #7 on the nonfiction list. It had been left off last week's list after the NYTimes claimed (but did not show) that someone was trying to game the list through bulk purchases. That claim was disputed by the Cruz campaign as well as HarperCollins and Amazon. The NY Times has in fact never shown any evidence to support its allegation. Instead they pretended this week that all was hunky-dory. "This week's NYT best seller list was arrived at using the same process as last week's - and the week before that," the paper's spokesperson Eileen Murphy wrote in an email to The Hill. "That process involves a careful analysis of data, and is not influenced in any way by the content of a book, or by pressure from publishers or book sellers," she added. If you believe that then I have some bottom land to sell you. In related news, Murphy also reported that the NYT Fiction Best-Seller List itself came in at #9 on the Fiction List. It was narrowly outpointed by the NonFiction List, which came in at #8.